Michy Batshuayi set for instant Chelsea exit? Batshuayi set for Monaco switch? 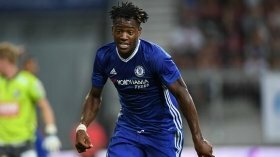 Chelsea striker Michy Batshuayi could reportedly follow Cesc Fabregas to AS Monaco, once he returns from his temporary spell at Valencia this month. The Belgian fell out-of-favour under Maurizio Sarri earlier in the summer and he was thereafter loaned out to Los Che for the 2018/19 campaign. However, his stint has been far from impressive with just one league goal and Los Che have recently confirmed that they are set to terminate the marksman's contract. According to France Football, Batshuayi is likely to be offloaded on his return to Stamford Bridge, given Sarri does not deem him as part of his first-team plans. It is added that Monaco are favourites to land the former Marseille striker with manager Thierry Henry holding a close relationship with the 25-year-old since working together with Belgium. Monaco have recently announced the signing of Cesc Fabregas from the west London giants after agreeing on a reported fee of around £10m for his signature.